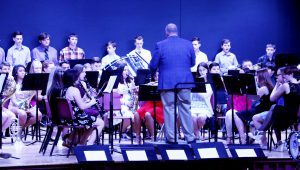 PULASKI – The Pulaski High School band took a step back in time during a recent spring concert, playing classic rocks songs from the 1970s and ’80s that their parents were probably more familiar with. Following the rock medley, the band performed John Lennon’s “Imagine” as a tribute to the senior students, who were performing their final concert at Pulaski. Jennings thanked each student for their dedication and commitment to the band over the past four years.